Spa Pedicure $25 or Gel Polish $3 OFF at Tip Top Nails in Las Vegas! Not valid with any other offers. Good at participating locations. One coupon per customer. With Valpak® coupon only. Coupon void if altered. Expires 05/06/2019. Eyebrow & Lip Waxing $14.99 OR $7 OFF Full Set Acrylic with Gel! Regular full set with gel is $45, now $38 with coupon. Not valid with any other offers. Good at participating locations. One coupon per customer. With Valpak® coupon only. Coupon void if altered. Expires 05/06/2019. Manicure & Spa Pedicure Only $37 at Tip Top Nails! Not valid with any other offer. Good at participating locations. One coupon per customer. With Valpak® coupon only. Coupon void if altered. Expires 05/06/2019. 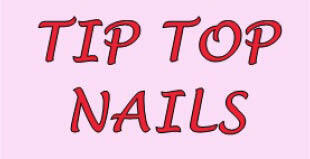 Tip Top Nails, located in Las Vegas, offers you time efficient, friendly and high quality service with every visit. Come in today and let us pamper you, you deserve it. Walk-ins are always welcomed at Tip Top Nails or you can make an appointment at (702)873-5265. Our specialty is to make you look and feel great while you face the world! So print our coupons above and see what we can do for you! Acrylic Nails, Nail Conditioning, French Manicures, Gel Nails, Male Manicures & Pedicures, Nail Art, Paraffin Wax Treatments, Sculptured Nails, Silk Wraps, General Manicures, General Pedicures, Shellac. Facials, Hair Removal, Waxing, Shellac. Tip Top Nails is proud to serve the Las Vegas Valley, since 1997, including Las Vegas, Henderson, North Las Vegas, Summerlin, Alliante, Centennial, Mountains Edge, Southern Highlands, Sun City, Anthem, McDonald Ranch, Spring Valley, Green Valley, Rhodes Ranch, Painted Desert, Nevada, Clark County, Red Rock, Lake Las Vegas, Nellis.